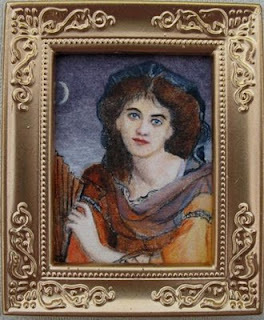 My name is Jean Boyd and I sell miniature paintings and needle felted animals and bears under the name of Miniartworks. As a child I loved a friend’s dolls house but it wasn’t until much later in life I finally got one of my own. This lead me to join Fantasia Dolls House Club where the ladies are so friendly and helpful I soon found I had the ability to make my own furnishings and accessories. Having taken art classes and been awarded a First for a full sized watercolour in a local competition, it seemed natural to try to paint in miniature. I am self taught from a couple of excellent books and have not painted a ‘big’ picture since. Acrylics on art paper is my preferred choice for my miniatures which come framed and are usually 2.5 x 3 inches in size including the frame, sometimes smaller. Mainly I paint portraits after Gainsborough, Reynolds, Waterhouse and many others. Dogs and cats are another favourite subject to paint. Commissions are welcome and on the home page of my website is a photo of a young boy I was commissioned to paint in a Victorian costume. 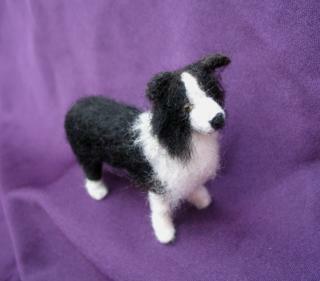 I discovered needle felting in 2007. Felting animals and bears soon became an obsession and a great number have been sold on eBay. Private commissions have included cats, dogs, foxes, a chimpanzee, orangutan, Bengal tiger and a mountain lion. It all started with a teddy bear kit offered for sale on an eBay forum and has developed from there. The teddy bears are thread jointed and most animals have a wire armature to enable posing.